Textiles occasionally become art but are traditionally a set of skills and source of livelihood. The past 70 years of the 5000 year old textile tradition have been marked by continuity and change as well as revival and birth. For a sector that is the largest employment source after agriculture, it is necessary to continuously go through preservation, continuity as well as reinvention. This was stated by Chairperson and Founder, Dastkar, Ms. Laila Tyabji. 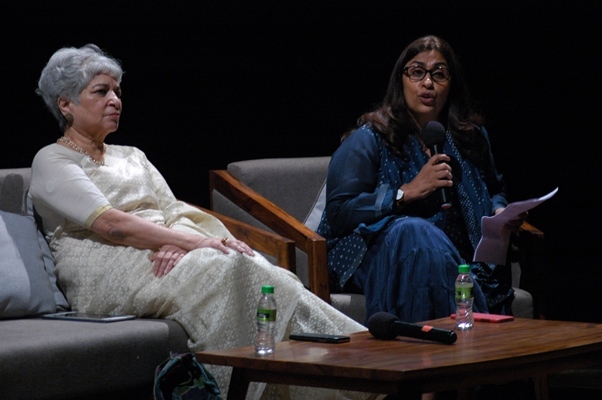 She was delivering the keynote address at the 2 day symposium which began in Jawahar Kala Kendra on Friday as a part of the exhibition – ‘New Traditions: Influences & Inspirations in Indian Textiles , 1947 – 2017. She further highlighted the journey of Indian Textiles from Gandhi’s call for handspun khadi to post independence when India was trying to discover its own identity after years of colonization as well as to the present times which are dominated by globalization, new media, internet and connectivity. The 1970s and 1980s brought a new energy, according to Tyabji, marked by a revival as well as return to tradition and ethnicity. Shops like Anokhi and Fab India alsorose and became a global brand name. Ms. Tyabji also spoke about her organization Dastkar which was set up with the objective to bridge the gap between rural crafts people and consumers. She also pointed out how Dastkar’s interventions are often cited as NGO success stories. Lastly, Ms. Tyabji raised her concern about craft becoming commodified and weavers and crafts-persons not having any economic or social status in the society. Apart from having a craft skill set, the crafts-persons also need to be skilled in entrepreneurship, technology, among others, to be at par with others in the society. Earlier in her Welcome Address, Director General, JKK, Ms. Pooja Sood said that the city of Jaipur has a strong association with textiles and design. A huge number of international designers also come to Jaipur to work. In this context, it is only apt to hold this exhibition at Jawahar Kala Kendra. The keynote address was preceded by a curatorial walkthrough of the exhibition by Mr. Mayank Mansingh Kaul. On Saturday (14 July) there will be various panel discussions on diverse topics such as ‘Towards Histories of Post Independence Indian Textiles’ and ‘Revival and Contemporarisation’. Creative Director – Abraham and Thakore, Mr. David Abraham; Founder – Anokhi, Ms. Faith Singh and Textile and Fashion Designer, Mr. Rajesh Pratap Singh will be a part of these discussions. It is to be recalled that the exhibition has been curated by Mayank Mansingh Kaul and designed by Reha Sodhi. The exhibition showcases artwork from over 50 artists and designers who have been dynamically influenced by cultural, political, social, economic and scientific conditions. It has been commissioned by JKK and will remain open to the public till 31 July from 11 am to 7 pm on all days except public holidays.